Discussion in 'Lets Talk about gambling and more...' started by Marina, Apr 11, 2014. The famous lines from the movie Gladiator conjure up images of Maximus and Commodus facing each other in the Colosseum. Although an epic, the movie hugely underplays the role of gambling in driving the gladiator games in ancient Rome. Large sums of money were to be won and lost as blood splattered and heads rolled. The gambling industry was strong back then, and the gladiator fights were like boxing matches for the Romans. One of the oldest forms of gambling constituted the practice of drawing "lots"— casting marked sticks or other objects and interpreting the results to predict the future. Today, there's state-of-the-art software available for predicting the outcome of a bet. People watch sports on sprawling flat-screens and bet on mobiles. Gambling has come a long way, and it's going stronger than ever. The role of gambling in shaping the society is hard to ignore. Games of chance were the earliest forms of entertainment on earth. Evidence is available that gambling had existed as far back as 2,300 BC in China, where tiles were used to play games of chance. The Chinese are also credited with the introduction of card games, which have culminated into a worldwide affliction for poker. Dice games were popular for betting since ever. Ancient dices dating back to 6,000 BCE have been unearthed at Egyptian archeological digs. The ancients believed that the outcome of the dice was controlled directly by gods. Dices were thrown not only for gambling, but also for choosing rulers, starting wars, or deciding other important matters. Gambling was common in ancient Rome and Greece. Everybody, from the emperor down to the peasant gambled. The Romans used to pray to goddess Fortuna for good luck. Greeks believed that their gods Zeus, Hades and Poseidon had shared the universe by throwing dice to determine the ownership of heaven, hell and sea. Gambling on dice was legally banned in Greece except at the carnival of Saturnalia; however, people found another way to wager. One person would hide nuts or pebbles in one hand and the other person would guess whether the number the hand contained was odd or even. The game became hugely popular for small wagers and evolved into many variations. If gambling was endemic in the ancient world, so was problem gambling. Emperors Augustus and Nero were notorious gamblers, whereas Commodus, the fictional villain-Emperor in the movie Gladiator, actually went bankrupt as a result of his gambling habits. After squandering away the public treasury, he turned his palace into a casino to make up for the losses and pay his debts. 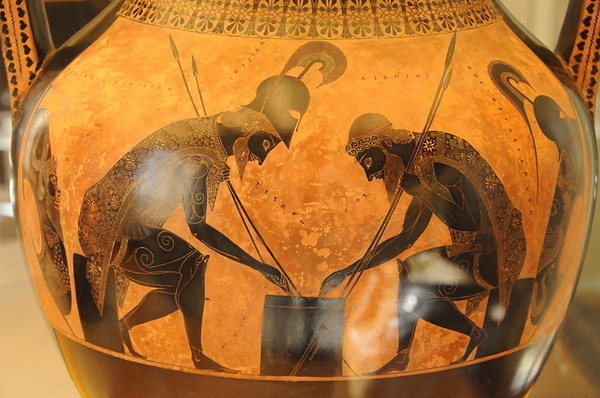 In a painted vase on display in the Vatican Museum, Achilles and Ajex, the Greek warriors brought to the pop culture by the movie Troy, can be seen rolling a dice while hunching on a table, clad in battle armour and holding their spears. In 100 AD, the King of Norway lost the District of Hising to the King of Sweden after the latter rolled back-to-back sixes to win one of the earliest recorded dice bets in history. used to throw dice for dispensing justice, considering it the word of gods. The word "dice" itself comes from dike, the Greek word for justice. The Romans were so fond of the dice games that they had, at the pinnacle of their Empire, made it compulsory for all children to learn to throw dice. The first accounts of religious curbs on gambling come from Jewish writings. Professional gambling, in any sort or form, was frowned upon by the rabbis and the society. Habitual gamblers were refused social acceptance, to the extent that they were denied a decent burial service or a Synagogue marriage. Gambling, however, was not illegal in Judaism and was allowed only if the motive was to donate all the winnings to charity. Gambling for personal gain was something to feel ashamed about. Christianity tolerated gambling better, but occasional bans were not unheard of. More than the scripture, these bans were placed out of the state's concern against people, particularly government officials and soldiers, wasting their time and money. With the fall of the Roman Empire and the start of the Middle Ages, new innovations were seen in gambling around the world. Crooked dices became common, dices that gave the same number when thrown over and over again. Dices with all high or low numbers were used. Sometimes, people would use a drop of mercury inside a dice to make it roll to their desired number every time. When caught, such cheaters would be led to pillory amidst beating and shouting and were made to wear their false dices around their necks. Craps: The modern-day Craps evolved from the medieval game "Hazard", which English crusaders had carried home from the Arab world. Hazard was a much more complex game than Craps and was played at unmarked tables. All you needed to play Hazard was two or three dices, so the game quickly spread across Europe. Poker and Baccarat: Also popular with the elite were the games of cards. Sophisticated wooden cards were painted on thin slices of wood for the use of the gentry. The present-day Poker and Baccarat continued to develop throughout the Middle Ages, and have the French Poque and the Tarot game Zero as their ancestors. Roulette: The modern Roulette wheel was invented in 1655, but its original form had been in use since much earlier, and was called "The Wheel of Fortune". Inspired by the Tarot card of the same name and carried on even today in the form of America's favorite game-show, the original Wheel was a tribute to the Roman Goddess of luck Fortuna. Other than dices, cards and wheels, the medieval folks had the improvisational skills to turn almost anything into a wager. Music, archery, chess, horseracing, and every other sport or public event could be used by punters to gamble on. As Europe was getting warmed up by a pervasive gambling scene, the New World was becoming a battle ground between the Puritans and the regular Englishmen arriving at the American shores. The English had no qualms about gambling, which they considered a part of their heritage from the old world. The Puritans, although they also hailed from England, had migrated to America to form a new world free of the pollutions of the old one. They were against everything that signified their ancestral traditions, and thus, banned gambling from the areas under their control. Lotteries: Other than in the Puritan-controlled areas, gambling thrived in America. In the 17th century, lotteries were introduced for the first time, allowed by none other than the Crown. These lotteries were transparent and intricate, and produced instant winners. The Virginia Company of London, which was authorized to hold the lotteries, sourced the money to establish its colonial ventures. Although the King abrogated the lotteries several years later, their use continued in the British colonies to raise money for development. In America, the most prestigious universities such as Harvard, Yale, Columbia, and Princeton were established using funds generated by lotteries. Several libraries, churches, and other public facilities were also founded with lottery funds. America was to become the new home of the gambling industry despite the resistance from the Puritans. The spirit of exploration that was central in driving ambitious settlers resonated closely with the tendency to take risks. Gambling continued in the forms of dice and card games right though the 17th and 18th centuries. From the start of the 19th century, gambling came under attack from moralists and reformists, who had always been opposed to gambling. Cases of huge embezzlements and frauds by the lottery operators led to their banning in most of the states. Commercial gambling was allowed to continue under the rule of President Jackson, who was himself known to be a compulsive gambler. Commercial gambling suffered from the aftermath of the Civil War, as well as the drying up of the earliest of organized gambling areas along the Mississippi River, which had ceased to be a route for trade following the arrival of railways. The gold rush spearheaded a boom in gambling, this time shifting the gambling territory to the west in California, from New Orleans where it had been prior to the half-century of depression. Laws to ban gambling came up swiftly, but remained ineffective at controlling the spread of gambling. It was, however, successful at driving gambling underground. The hide and seek between the gambling mafia and the law enforcers continued until the early 1930s, when gambling was largely legalized to mitigate the effects of the great depression. It was around the same time that Benjamin "Bugsy" Segal, the persecuted New York crime boss moved to the West Coast and orchestrated the rise of organized gambling industry in Las Vegas. His Flemmingo, along with many other casinos in Vegas, were financed by the mob. In this sense, the underworld played a significant role in the rise of the modern US gambling industry. In contrast to the turbulent journey of the gambling industry in America, things went on more smoothly back home. Gambling had developed over most part of the millennia, and was deeply intertwined with the culture and traditions. The importance of gambling towards generating economic activity has traditionally been realized in the Britain. The intelligentsia agrees to the essentiality of gambling to satisfy human urges for entertainment. This more rational approach has resulted in the introduction of more stable curbs and balances for regulating commercial gambling. In modern times, gambling in the Britain remained controlled by legislations such as The Betting and Gaming Act 1960, which allowed commercial bingo halls and casinos to be set up, provided that they operate as "members-only" clubs. Some of the first casinos from that era include The Casino Club Talbot in Wales, the Charlie Chester Casino and Golden Horseshoe in London and the Kingsway and Grand Casino in Southport. The gambling regulations were liberalized until The 2005 Gaming Act allowed for the establishment of Las Vegas style "super casinos" as resorts. Plans were made to start the first super casino at Manchester, but were never realized because of the prevailing political and economic circumstances. The 70s and 80s were boom years for casinos. But, there was another industry that was booming at the same time. The rise of personal computers and Internet accompanied the rise of gaming industry, and the two were set to merge at some point. Microgaming, an Isle of Man based Software Company, developed the first software for online gaming. In 1994, two obscure Caribbean nations of Antigua and Barbuda did something that would change the face of gaming industry forever. They started issuing licenses for online casinos to interested parties. With casino software from Microgaming and security from CryptoLogic, another Ireland-based software provider, the online gaming scene was ignited. Microgaming and CryptoLogic handle the licensing, payment processing, and other services for their clients, and also own several online casinos and poker clubs. There has been no looking back for online gambling since 1994. The Internet gambling industry is reported to be earning $30 billion annually. The UK remains the global hub of online gambling, with a consumer market estimated at £1.9 billion. Online gambling is currently banned in the United States, but the federal government allows individual states to legalize gambling. So far, Nevada, Maryland and New Jersey are the only states that allow online gambling. The debate to legalize online gambling is raging in the US, and analysts predict a $2 billion regulated market size by 2020. All looks green for gambling in the foreseeable future. Online gambling continues to grow at an exponential rate and can be expected to surpass casino gambling at some point in time. Smartphones have brought a new kind of convenience to online gambling. The future may hold new ways to gamble and new type of stakes; who knows? The only thing certain is the uncertainty of chance. Wow that is some great info!